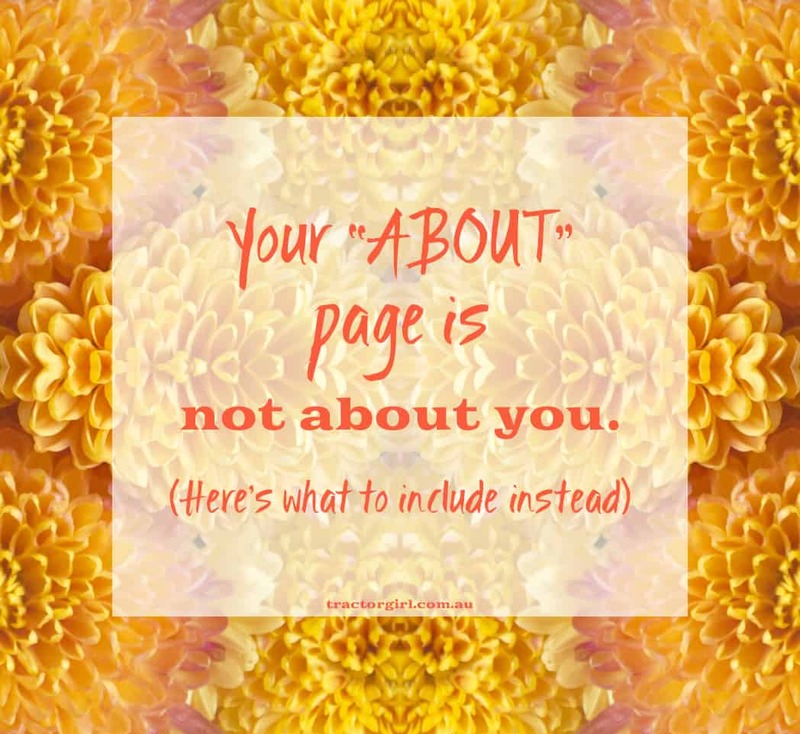 The Number One rule about your About page is – it’s not about you. It’s about your AUDIENCE. They want to know why you’re right for them – so, make it easy for them to decide! And of course, there’s a heap of different ways to create a standout About page – videos, graphics, animations… but whatever the format, here’s my checklist of things to remember. Don’t ever underestimate your ‘About’ page’s importance – next to your home page, your About page is the 2nd most looked-at page on your site. Don’t believe me? Think about what YOU do when you’re checking out a new site. Ha! We ALL do it. Let me say it again: it’s about your audience, not you. Especially when you’re a small business, and ESPECIALLY when you’re a solopreneur. 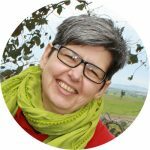 And your audience want to make a personal connection – so don’t write in the third person; it’s stiff and formal. Always be a human, and always write in the first person – it’s about you and me. See? Your audience wants to see you. Speaking of being human – we connect to faces, so show yours! Make sure your image is well-lit and crisp. You don’t have to use a professional photographer (although a good one can be ace!) – just no blurry late-night snaps taken at that friend’s BBQ 5 years ago PLEASE. And definitely get rid of the red-eye. Who’s it for? Think very clearly about this – who exactly is your audience? What’s their exact problem? ALWAYS keep this in the back of your mind when you’re writing. You speak to little kids very differently than you do to your elderly grandmother. You speak to the mechanic differently than the hairdresser. It follows then that you need to understand your audience properly so you can speak to them “in their language”. What value do you give your readers? There’s a point to your About page – it’s about what you can do for your audience. People are looking for specific information. What sorts of questions do people ask when they get to your About page? They want to know if you’re a big company or a small one; is it just you, or are there other people involved? How long have you been in business? Where are you based? What are your core values? Importantly, why would they buy from you and not from your competitor? The reason is because you demonstrate that you understand them and their situation. You can do this by telling a bit of your background story that you know will resonate with what’s in their heads right now. Social proof is awesome. Because your potential customers not only want to get to know you, they need some kind of guarantee that you can actually solve their problem for them. Include some testimonials from happy customers! They’re most effective when the happy customer talks about how they were struggling, what they were looking for, how you helped them, and what the result is. There’s lots of other ways to include social proof too. Press mentions (Remember that article in the local paper with the great photo? Include that magazine article too!) and mentioning that you’ve guest posted on that high profile blog are always good. Visuals are important, but they’re not the only thing. Visuals are your first-line defence seduction. They’re there to grab your audience’s attention; they’re there to set the mood; they’re there to support what you have to say. Make them count, but remember that the words add substance. How to write? The tone of your Brand Personality will be your guide when you write your About page, so you can be as down to earth or as quirky as your brand suggests. Branding is all about conveying a consistent message and personality in everything you do – so how you write when your brand is whimsical or ethereal will be quite different to how you write if your brand is boisterous and fun. Think about the About pages you’ve read. The ones that really grab you are not the factual ones, the ones that simply list qualifications, or the ultra-brief ones that say “I’ve got three kids and in my spare time I like cooking and listening to music.” It’s the ones that tell a story about that person – what they think about and how they got to where they are now. Tell a relevant story – snippets from your life can ground a sense of who you are and what you’re like to work with. It could be a story about your humble beginnings, and about your dream. Bring your readers into the story of your vision for the future. And yes you CAN include the odd random fact about you – shows you’re a real person and just as weird as the rest of us (psst: Don’t include your whole life story – it’s too long, and the vast majority of it’s probably not relevant to what you’re doing in your business. Save it for your autobiography when you’re a squillionaire). Include your call to action on the page – if people like what they read, they’ll want to maintain the connection. Don’t get them all interested and them leave them hanging for more… because chances are once they click away, they’ll get distracted by the next shiny interweb thingy and forget all about you. Once they’ve given you their email addy, you can maintain the connection and build on the sense of expertise, familiarity and trust by sharing beautiful, relevant and useful information. Break your text up. We’re a culture of skimmers. ONLY if something grabs our attention will we be bothered to stop and read the whole damn thing. Break your text up with headings, highlighted text etc. And add images – photos of you! Check and update regularly. Don’t use that 5-year-old photo of you. Don’t include your Blab connection or your Periscope or any of your other out-of-date-social-media-that’s-disappeared-into-a-black-hole. And of course, make damn sure that what you say in your About page is still aligned with who and what you are, and what you have to offer. Have I convinced you how important this page is? Good! Now, go back and plan out your About page, and get writing. And when you’re done, you can join me on the minibus – you’ll receive my free ebook “Build Your Brand” and regular hits of branding tips straight to your inbox. See you there!